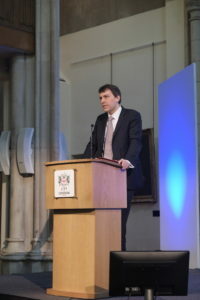 “True diversity in the workforce isn’t just about the people we employ, it’s about the way we employ them. . .” John Glen, Economic Secretary to the Treasury spoke at the Women in Finance Charter Annual Review launch event on 14th March 2019. You can read a the full speech below or download a PDF here. It’s a pleasure to be here among so many like-minded individuals. Each of us is here this morning because of our commitment to creating a better gender balance across the financial services sector. It’s a commitment rooted in the belief that a more inclusive workforce is better for employees, better for businesses and better for customers. The importance of this shared endeavour was brought home to me last week, when I attended the launch of the FinTech for Schools programme. It was held at the City of London Girls School, but included pupils from across the Square Mile. These wide-eyed young men and women were bright, enthusiastic and excited about the future. They asked genuinely probing and intelligent questions. And they had precisely the qualities that the financial sector needs. My message to them was simple. Whatever their background, whatever their skill set, there was a place for them in the financial services sector. Male or female, it was a career in which they could invest their energy and talent – and, in return, it would take them as far as they wanted to go. Our job – and the reason we’re here – is to make that promise a reality. Today sees the publication of the Second Annual Review of the Women in Finance Charter. …and to recommit ourselves to taking the next steps in this journey together. And for my part, I’d like to use my remarks to encourage you to go further and faster toward our goals. We’ve certainly come a long way. As many of you know, HM Treasury published the Women in Finance Charter three years ago. It asked financial service companies to commit to greater representation of women in senior leadership roles in the near term, with the long-term goal of an equal gender balance across the sector. In the early days, the challenge was getting firms to sign up. But today, the figure stands at over 330 organisations, representing more than 800,000 employees. They come in all shapes and sizes, from the newest and most exciting start-ups to the venerable giants of global finance. I’d like to take this opportunity to thank Jayne-Anne Gadhia, our Women in Finance Champion. Jayne-Anne’s review in 2015 was the genesis of this Charter, and her tenacity since then has been instrumental in the progress we’ve made. I’d also like to thank all the signatories here today who’ve made that commitment. It may only be the first step, but it’s a powerful one. Because leadership matters. Public commitment is important. And it sends a signal to the rest of the sector that this is the right thing to do. The good news is that others are already following in your footsteps. Today, I’m pleased to announce that another 36 firms have joined us. If signing the charter was the first step, the next was for firms to work toward specific targets for greater female representation at senior levels. Today’s Review shows that you’re making progress. 45% of signatories have met or exceeded their targets already. Another 42% are on track to do so…. …which means the vast majority of signatories have maintained or increased the proportion of women in senior management roles over the past year. And, to be candid, the progress we’ve made over the past few years has been modest. There can be no hiding from the uncomfortable truth that we still have a long way to go. I’ve been in post for a little over a year. But I’ve seen examples of some of the institutional barriers we’re up against time-and-again. Why is it that so many talented women choose to leave the sector in their 30s? Why does the financial services sector have the largest gender pay of any sector? And why, in 2019, do women still report that some organisations still feel like ‘boys’ clubs? There’s no doubt that the sector has the right intentions – but they don’t seem to be cutting through. For all the efforts you’ve made to date, too few women are making it to the top. I recognise there are no quick fixes. Changing the culture of any organisation is a slow and grinding process. It took 800 years for a woman to take her place as Lord Mayor of London. Which is obviously outrageous. And although I don’t expect the Charter to influence change overnight, I definitely expect change much quicker than that! So I expect to see evidence of your sustained commitment. And to see firms willing to take radical action to bring about the necessary changes. At the same time, I’m asking Treasury officials to explore all the levers that are available to me within government to keep the pressure up from my end. But ultimately the onus is on you, as leaders within this sector. It’s not enough for gender to be a recurring item at monthly board meetings. Good intentions need to be translated into tough, tangible, action. Because this is an injustice that needs to be put right. I know that some of the firms here today have met your initial targets, and are already setting stretching new ones. That’s the right attitude and I encourage others to do the same. I’d like to see all signatories move to targets of 33% and above to align with the Hampton-Alexander Review. And I want firms to track and review their approach on a regular basis, so they can demonstrate the progress they’re making. But this needn’t be a lonely journey. We want to see change not just in individual companies, but across the length, breadth and depth of the sector. I encourage you to take inspiration from one another’s achievements and share best practice within and between sectors. If you have ideas to bring your sector together, then the Women in Finance Team at the Treasury can assist you. And there are a range of trade bodies, networks and other allied organisations that can also help. There’s a huge amount we can learn from one another. In both my ministerial roles – at DCMS and now at the Treasury – I’ve been fortunate to work with women who job share in senior Civil Service roles. I’ve found they can provide me with a wider range of skills and experience than a single person could in the same role. Likewise, the Annual Review includes some great examples of actions that firms have taken. Lloyds Banking Group instructed external recruitment agencies to ensure women account for a third of candidates shortlisted for senior management roles, and they’ve already seen a rise in the number hired. And Santander has run a leadership development programme for women – many have gone on to secure new roles in the company as a result. If they can do it, so can the rest of you. We hope that individual sectors will hold events over the coming year to help you share ideas. We have a significant opportunity to make fundamental changes throughout all parts of the financial services sector, whether it is within more traditional established areas, such as banking and asset management, or growing areas like Islamic finance, FinTech, and Green finance. There’s a big role for men too. Perhaps in the past we’ve shied away from the issue because we were worried we would say or do the wrong thing. Or because we felt we were part of the problem. In fact, we’re part of the solution. I was pleased to chair a roundtable discussion with industry leaders at No11 Downing Street in January that focused on the role of men as agents of change. We have an important job to champion and drive this agenda, and lead others to do the same. And let’s face it – a more equal and inclusive workplace is in our interests too. We have as much to gain from a better work life balance as anyone. And that leads me to my concluding point, which is about the scale of our ambition. Greater female representation is a stepping stone to gender parity. And gender parity is, in turn, part of a wider ambition for a more diverse, more inclusive, financial sector. The litmus test of our efforts isn’t just whether we’re hitting the right numbers. It’s about whether women can enter this sector and succeed on the strength of their merits alone. Our efforts must reflect and advance the cause of women in all their diversity. And the same applies to men for that matter. Or disabled people. Or the LGBT community. Or people from different ethnicities or socio-economic backgrounds. We want an industry that is not only more open to women, but more open to everyone. A sector where the brightest and best can get ahead, irrespective of who they are or where they came from. Today’s Annual Review reveals the Charter is helping to bring about the wider changes in workforce culture. Greater emphasis on mentoring and leadership development. The kinds of practices that benefit men and women alike. Because true diversity in the workforce isn’t just about the people we employ, it’s about the way we employ them. It’s about being open to graduates and apprentices. To people who join mid-career. And those who work their way from the bottom all the way to the top. It’s about accommodating people who work part time. People who want to take career breaks or secondments or who serve as reservists. And it’s about nurturing people at every stage of their career. Supporting them through life’s ups and downs with a grown-up approach that can adapt when personal circumstances change. So the targets we set ourselves are a means to an end. And as we work towards them, we shouldn’t lose sight of what we’re trying to achieve. A sector that is not only diverse but truly inclusive. I want to thank you for your commitment to date, and the progress you’ve made over the last year. The more you achieve, the clearer it becomes how much more we can achieve. So I make no apology for being restless and demanding in my desire for even greater progress. And I am watching this closely – no measures are ruled out for the future. We’ve started this journey together. And there can be no let up, until we reach our destination. A stronger, more agile and resilient sector. One that has the best people – with the right skills – to meet the challenges and opportunities of the future.